← Say hello to Momiji – adorable message dolls! When someone asks if they can send you a roller skating unicorn pin … YOU SAY YES. 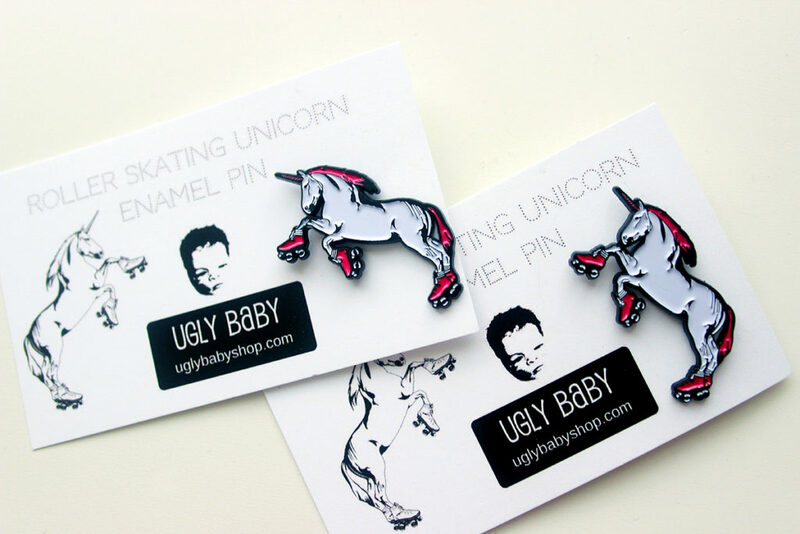 These amazing pins are by one of my faves, Ugly Baby. You might know her more for her shower art, which I have in my bathroom, but she has some other fun stuff in her shop like these guys! She sent me two pins – one for me, and one for a friend. But I sorta took them both… and used them as collar pins! If you want to pick up one of your own, hit up Ugly Baby on Etsy! p.s. this dress if from Kee Boutique, and I don’t know if I got big or it got small, but now I can no longer zip it all the way up without feeling like a tightly stuffed gingham sausage. This entry was posted in Blog and tagged sponsored. Bookmark the permalink. 2 Responses to Roller Skating Unicorn! Those are sooo cute! Great idea to use them as collar pins. It looks amazing! Oh man! Collar pins! Now I have to get them made facing the other direction too so they can look at each other. Teehee!